Today’s Gospel finds Jesus retreating with the twelve apostles, who’ve just completed a preaching and healing mission deployment. Jesus has debriefed the Twelve about what they’d seen, heard, and been doing in his name. He’s preparing them for what’s ahead when he puts them on the spot with a pointed question: “… who do you say that I am?” Peter replies, making the good confession: Jesus is the Christ of God, the Messiah. Then, Jesus describes what it means to come after him: self-denial, following Jesus’s lead, 24/7/365, suffering, perhaps even dying for your faith, without shame or hesitation.Transfiguration, then crucifixion, and resurrection lay ahead. Jesus would not have his followers unprepared. 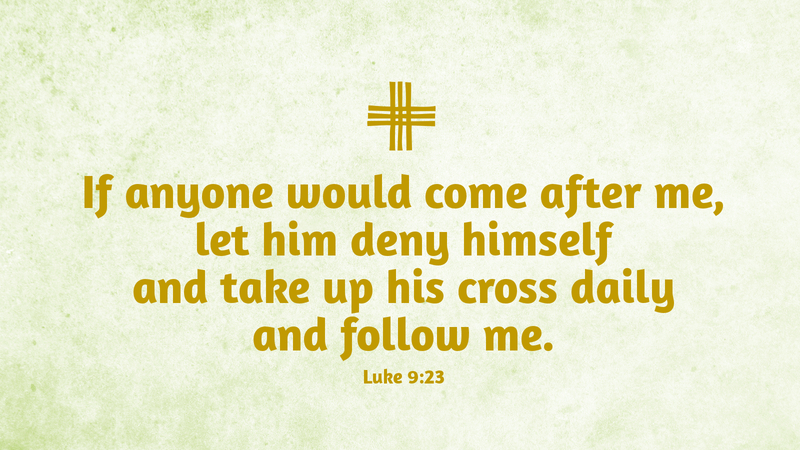 Lent’s approach beckons Jesus’s disciples to retreat—not by running away, but in prayerfully stepping back with the Word, reconsidering our past, present, and future in Christ, and preparing to take up our cross anew. Holy retreating prepares us to make the good confession, to repent how we have fallen far short, and to re-shoulder our crosses, unashamed, until Jesus returns. So may it be for us in the Lenten retreat season to come. Prayer: Come, Holy Spirit to gather us and guide us into retreating with the Living Word, our Jesus, that we may be well-prepared to give all glory to the Father through him. Amen. Today’s devotion was written by Cathi Braasch, retired NALC Pastor.